1. Aid in process development for new devices. 2. Technician support via phone, video, and on site. 3. Tipping services from prototypes to production. Meet your launch goals! Cath-Tip’s Development Team is available to support your R&D Department in formulating fabrication methods for the production process. 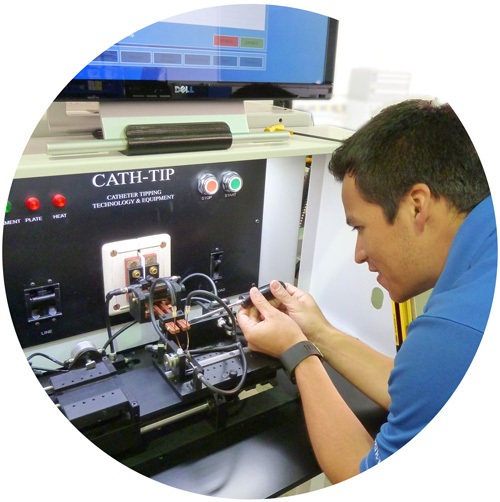 Whether it is a simple tip or a complex assembly with multiple materials and operations, the Cath-Tip team stands ready to perform the development work for proof of concept and then refine it into a production process. The first step is to establish the necessary dies and tooling needed based on the customer’s technical drawings. With Cath-Tip’s supply of over 100 dies, very often one is available that is close to the desired geometry or configuration. Once the appropriate tooling elements are built they are incorporated into a modular package that facilitates quick change and minimizes setup time. The process parameters are then developed and saved as a recipe file which can be loaded on the machine or transferred between machines. Recipes control the specifics of heating, cooling, clamping and automation to perform the repeatable steps necessary to produce perfect parts. At that stage, Cath-Tip can continue to manufacture small lots of parts or we can prepare the process and tooling to be transferred to the customer for in-house production. We also have a partner contract manufacturer who can take over catheter production. Sometimes a visual is needed and for that Cath-Tip offers web-based video support. The Magnum’s onboard PC allows a Cath-Tip technician to log in remotely and control most functions of the machine from our facility. To secure maximum up-time, it may be most effective for a Cath-Tip technician to visit a customer’s facility. 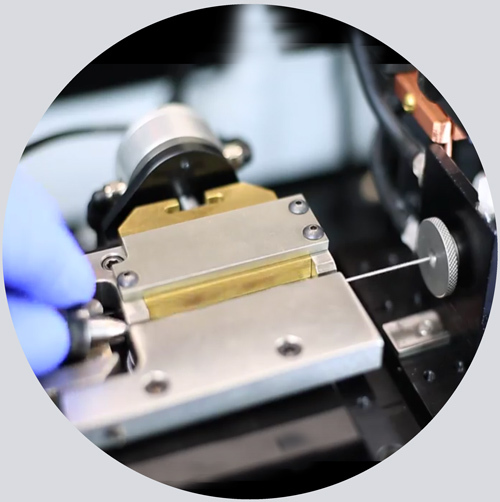 New Process Implementation – We can help fine-tune your new device’s production process. Calibration – Increase up-time and improve yield with routine calibration of your machines. Troubleshooting – We stand by our equipment and want your machines up and running those quality parts. Cath-Tip offers catheter tipping from prototypes to full production. We can produce engineering samples for customers using in-house dies (customer supplied tubing). Our inventory of over 100 dies of various sizes and geometries will approximate the customer’s design for testing. This reduces R&D costs and minimizes capital requirements. Once a customer has settled on final part design, we can build custom tooling on which they can make parts to exact geometry. Or, we can continue to use our in-house dies to provide small quantity production runs – allowing the customer to put off the purchase of a tipping machine until production volumes warrant bringing it in-house. Or, we can set up full production with our partner contract medical manufacturer. Cath-Tip listened to customers’ financing needs and now offers a capital equipment lease option. Call 435-628-1775 or email us for details on our equipment service contracts.